In a recent article by the always interesting Bikhard Bilger in this week’s The New Yorker (April 25), we learn about David Eagleman’s research on the brain and time perception. Eagleman, a neuroscientist at Baylor College, wants to understand how we experience time, an especially interesting question considering how subjective time can feel in those moments when it seems to race ahead, or stand still, or slow down. 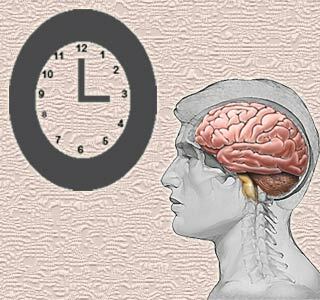 How much is our perception of time regulated by our brain structures, and how much is shaped by external forces? In early 2011, Eagleman conducted a research project on musical time in London at the studio of music producer Brian Eno. Eno was curious to know whether or not drummers’ timekeeping acuity is evidence of unique brain structures or brain functioning. Eno wanted Eagleman to answer the question: “Do drummers have different brains than the rest of us?” Eno, an adventurous thinker himself, was inspired by an experience he once had while recording the band U2 in the studio. During one studio session, the band’s drummer, Larry Mullen Jr., claimed that he couldn’t play with the computer-generated metronome click track because it was ever so slightly off–a tiny tad behind the beat, to be precise. To Eno’s surprise, Mullen was right: the click track was in fact clicking behind the beat–by a mere 6 milliseconds. How could a drummer know and perceive this? If I may weigh in here as a drummer: I think there is some truth to the idea that drummers sometimes hear rhythms in everyday soundscapes that others may not notice. (I’ve had my own pleasurable moments of picking out a rhythm in the sound of subway train, or even in the pattern of my dog drinking water . . .) But what’s more interesting to me is that one of the qualities Eagleton’s test overlooks is how a good drummer generates a sense of kinetic, forward-moving musical motion–colloquially called a good “groove”–by not being perfectly steady, but rather by being subtly elastic. Metronomes and click tracks, just so you know, are never elastic (unless they are tempo-mapped to subtly speed up or slow down over time). So as I write this I’m starting to wonder why I once spent so many years dutifully practicing to metronomes . . . Likewise, if you’ve ever wondered why some electronic music sounds “stiff” it’s because instead of a human drummer incorporating little pushes and pulls on the time (or what the ethnomusicologist Charles Keil once called “participatory discrepancies”), the groove is machine-generated and locked in or “quantized” to a rigid temporal framework that squares off notes to the nearest sixteenth- or eighth-note. It’s the exact opposite of elastic: stiff. And we hear stiffness as being “cold” or even as a kind of deadness–as if a chilled rigor mortis has set in on the music. So, perfect timing is not really the thing for musicians. In fact, good timing for a drummer means to be imperfect, albeit in a reliable and groovy way. It’s a difficult dance to master, maybe because, as the late Senegalese cultural theorist Leopold Sedar Senghor once observed, “rhythm is the most perceptible and least material thing”–and immaterial things are hard to grasp, let alone master. At any rate, great drummers make the task of making good rhythm with good time look and sound effortless while lesser drummers make it look and sound as if something is subtly but oh so deeply wrong! great imfo.much appreciated.have been recording with click for 20 yrs,but still hear small wavers when matched to computer any ideas ? explains that in a recent analysis of Jeff Porcaro’s recorded playing, deviations in his timing are actually found to be fractal patterns (!) Volume dynamics are also fractals, though independent of the timing fractal. Mr. Bosworth, this may help address your question. I have just discovered this blog and it is wonderful. Have you read of this recent research? The article on Porcaro’s timing is fascinating! Thanks for bringing to my attention Tristan. Thanks for your comment Paco. I suppose sometimes we play with metronomes during the recording process–to make later editing easier. Musicality must include one’s sense of time too–as you say, having a sense of rhythm is integral. As those videos illustrate, “good time” is often flexible yet still steady and forward-moving. Practicing to a metronome has its benefits though: sometimes it can suggest some of our perceptual shortcomings and prompt us to reset our time sense. Great performances seem to generate their own time worlds…I didn’t know about the program at Amsterdam U. so thanks for that information too. It looks like you quoted me without attribution. Interesting anecdote and thanks for reading!